An enormous 158.2-carat pink diamond – making it one of the largest in the world – was discovered in Russia in September by Alrosa. This stone is only the 32nd largest stone according to experts, but its splendid pink color makes it incredibly exceptional and rare. It is valued at about $1.5 million. If it were to be cut, it would make for many highly precious diamonds that could be used to create priceless jewels. 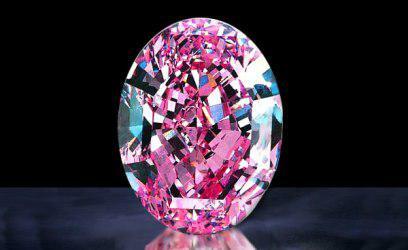 Like the 12.27 Majestic Pink Diamond auctioned off in August in New Orleans by MS Rau Antiques for $7.85 million. It had been mounted on an amazing ring. The discovery of the world’s largest sapphire, a 93-pound specimen that a Sri Lankan company reportedly hacked into pieces, including an 85,000-carat chunk that it hopes to sell for some $800 million. “We are very positive that this stone will bring a lot of fame,” an unnamed company representative revealed in an on-camera interview that appeared on The Wall Street Journal’s website. Meanwhile, halfway around the world, a Christie’s auction set a new per-carat record for a nine-carat Kashmir sapphire—just one of a string of landmark jewelry sales that occurred this year. Gems are making headlines due to a perfect storm of sorts. 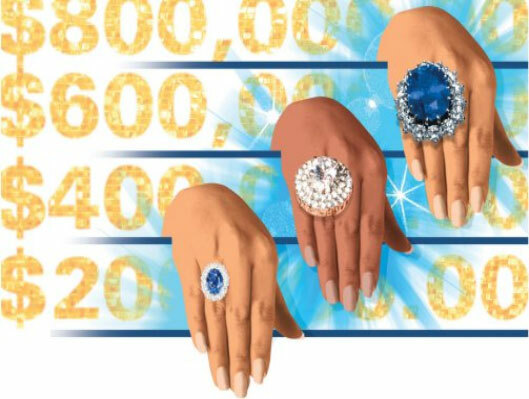 Interest in rare jewelry and colored gems has been on the rise for years, thanks to wealthy consumers who want to find a reliable way to diversify their assets. At the same time, gems are benefiting from a bit of celebrity cache: the Duchess of Cambridge and her Sri Lankan sapphire engagement ring are said by the country’s National Gem and Jewellery Authority to have been responsible for a double-digit spike in the sapphire market last year. At auction, rarity is the main cause of record-breaking prices. Sotheby’s, bolstered by the sale of the Evelyn and Estée Lauder estate jewelry, reached landmark totals for single-day and annual sales of jewelry this year. Among the most coveted pieces was Evelyn’s 6.5-carat pink diamond ring, which sold for $8.6 million—$3.6 million more than the expected price. At Christie’s in Geneva, Switzerland, last month, a 76-carat colorless diamond from the 16th century sold for $21 million, 40 percent more than its expected price. Still, the search for the next big thing never ends: last week, the Travel Channel greenlit a seven-episode run in 2013 of Gem Hunt, which will follow a gem dealer as he searches for the perfect stone in Sri Lanka. There is no surprise that the 10.48 carat, flawless, Fancy Deep Blue, Briolette-cut diamond attracted so much attention at Sotheby’s Geneva sale of Magnificent Jewels on Wednesday, November 14, 2012. This stunning and extremely rare diamond managed to garner more than double its estimated price, and sold to ‎Laurence Graff for a whopping USD$10,860,146 (USD$1.04 million per carat). No one questions that the natural colors found in some of the diamonds out in the market are among the most pleasing things to lay your eyes on. Hence, it is no surprise that the attribute of color is the most dominant characteristic of a fancy colored diamond, and therefore considered most important. This stone was graded as a Fancy Deep Blue without any overtone colors at all, which is considered extremely rare. However, having that said about the color, we should not forget that the other three of the 4Cs, carat weight, clarity, and cut, are considered extremely important and contribute immensely to the appearance of the stone. The affect of carat weight is rather clear, as it defines the actual weight of the stone. The weight is not directly connected to the size, but needless to say one is very closely connected to the other. This stone is 10.48 carats, which for any fancy colored diamond is enormous. Similarly, the clarity of the diamond is important as it defines both the amount and various types of inclusions found either on the internal or external area of the stone. These inclusions in the diamond can damage the brilliance that shines off the stones as they interrupt the reflection of light and may also be detrimental to the look of the stone if visible with the naked eye. However, the blue briolette diamond is a flawless gem, which means there are no blemishes found at all. The diamond cut, as the single attribute which is controlled by man, can display a number of differences in the stone which still remain somewhat unknown to many. To start, the symmetry between the many faceted arrangements in the stone are very important towards the look, so much so that the Gemological Institute of America (GIA) grades it on a diamond certificate. Similarly, the type of cut used on the stone changes the appearance dramatically, and is also graded by the GIA. A Briolette cut is extremely unique as the entire gem is three dimensional. Blue diamonds, especially without any overtone color, are considered extremely rare among others in the fancy colored diamond family. Its clarity is flawless, which is the highest clarity grade any diamond can receive. Its size, especially with such a phenomenal color, is almost never seen in the market today. Its make, in terms of polish and symmetry, was awarded the highest ‎possible grade by the GIA. Finally, its briolette cut allows this magnificent stone to clearly stand out from the others. 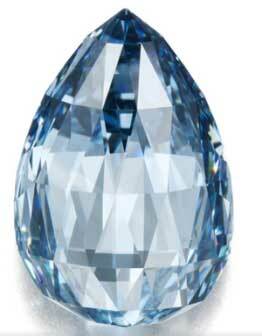 The blue briolette diamond was yet another record breaking stone for both the highest price paid for a fancy deep blue diamond and the highest price paid for a briolette diamond.